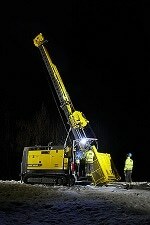 With the new carbon emission free LHD loader, Atlas Copco lives up to its brand promise “Sustainable Productivity”. 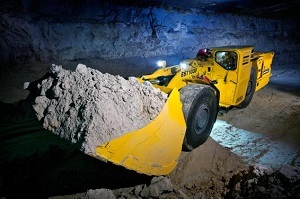 The latest addition to Atlas Copco’s range of Scooptram underground loaders – the Scooptram EST1030 – is an attractive alternative to diesel equipment in underground mining. Due to the electric motors high efficiency, this electric loader consumes less energy, produces less heat and has a lower noise level, than a diesel equivalent machine. “- The global release of the EST1030 shows our commitment to green technology and sustainable mining solutions.” says Franck Boudreault, Regional Business Manager. In underground mining, ventilation has always been an issue. An electric machine requires very little ventilation, only a minimum must be kept to keep the dust and heat at acceptable levels as well as air for the operator. Cable powered electric loaders is not new in concept, they have actually been around for quite some years. The cable and the cable control have however always been a problem area. High tension caused the cable to wrap around corners causing cuts and high cable wear. The EST1030 introduces a new and patented cable control system that minimises the cable tension as well as cable wear. It is easy to operate the electric loader. Any operator that has used a ST1030 will feel right at home when entering the EST1030. All controls are the same as in the diesel version and with a minimum amount of training the operator is quickly at his full potential. Key safety features include spring-applied, hydraulically released (SAHR) brakes. The ISO and ROPS/FOPS approved cabin features the Atlas Copco foot box that provides increased leg room and ergonomic control placements. The cabin is placed on rubber mounts, reducing vibrations. “Health and safety is always on top of the agenda. By switching from diesel to electric there is a big improvement in air quality as well as a major noise reduction.” says Erik Svedlund, Product Manager Electric vehicles. The electric Scooptram EST1030 share 90% of its components with the proven and very successful diesel Scooptram ST1030. The diesel version is sold in large numbers all over the world. This ensures spare part availability as well as product support in even the most remote places.